Update: This bakery is now closed. There was a stellar deal on BuyWithMe not too long ago for $5 for $10 worth of baked goodies at George’s Wonderful World of Cakes in National City and I couldn’t pass up such a great deal. Here’s a little review of the items I tried there with my coupons. 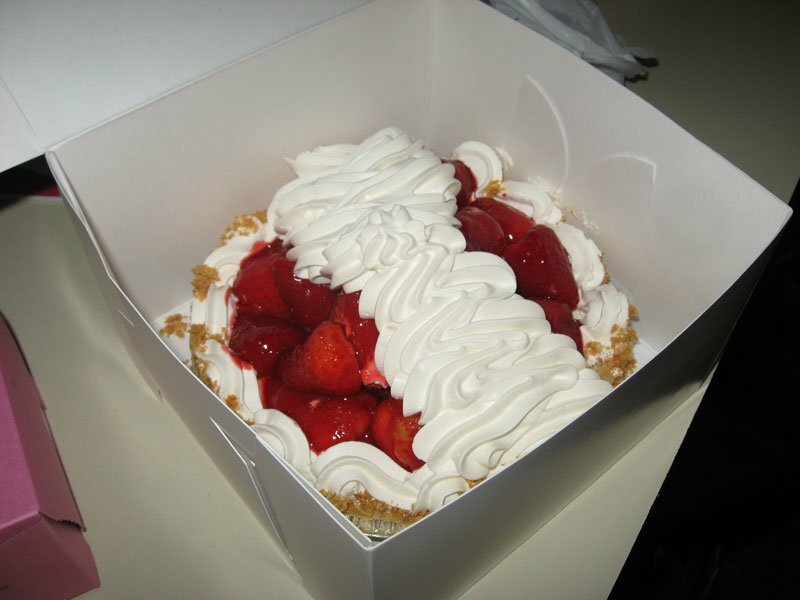 The Strawberry Pie ($12.75) is an item that I got twice because it was just that good. Fresh strawberries, whipped cream, a creamy sweet custard and delicious, flaky pie crust make for a pie that can do no wrong. I love the thick layer of whipped cream (real, fresh whipped cream) piled across the top of the pie, too. Very good! These are some coffee/breakfast cakes ($6.50) that they sell. These are different than the ones I’m used to seeing in the grocery store since they’re rounded and in a spiral shape. On top, we have half of a lemon coffee cake, half of a pecan coffee cake and on the bottom that’s an apple coffee cake. I think my favorite is the apple. These cakes are moist and tasty and taste so much fresher than anything you’d get at the grocery store. I hardly had any of the lemon coffee cake since it was devoured by my family and by Jake. Must be good if so many people ate so much of it! This is a Lemon Snow Cupcake ($1.50). 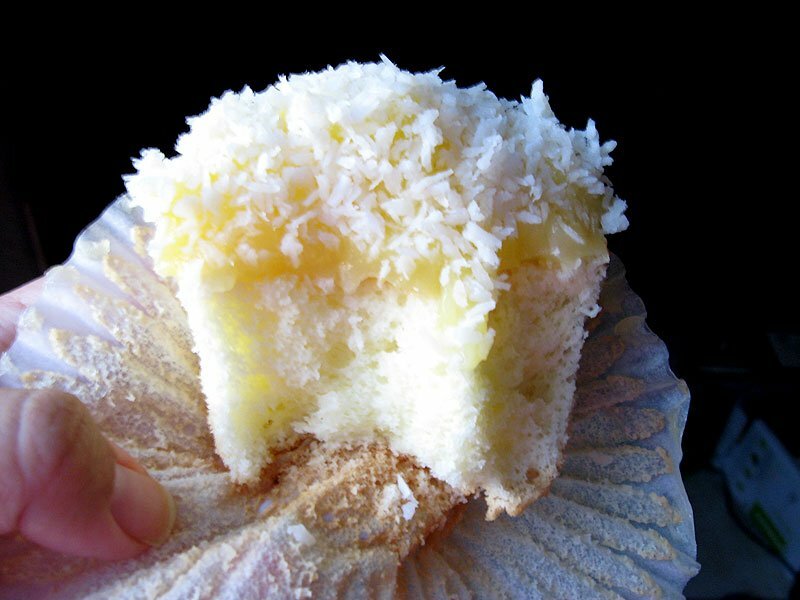 It’s got a vanilla cupcake base with I believe lemon curd and coconut on top. Light and totally messy with a nice mild lemon flavor. The cake on this one was better than on the other cupcakes I tried. Sweet, moist and tasty. These are 2 cupcakes I had on my first visit. 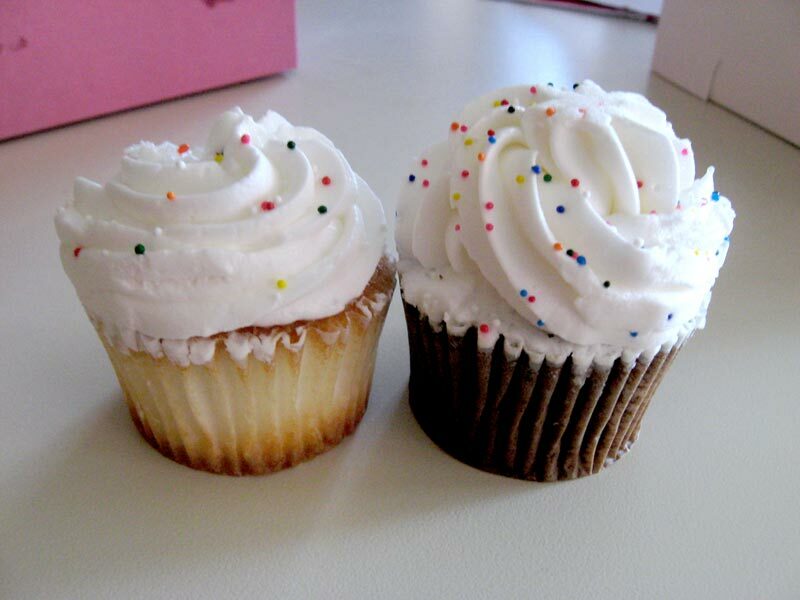 The left one is vanilla with whipped cream frosting and the right one is chocolate with whipped cream frosting. I really like the frosting, it wasn’t too sweet though it was tasting not as fresh. The cupcakes were really dry and only edible with the frosting on them. I didn’t like the cake by itself since it was just too dry – it tasted like it had been sitting around for a long time. George’s Wonderful World of Cakes offers up various cakes and pies as well as cream puffs, eclairs, cookies and diabetic friendly treats. The diabetic friendly sweets I saw were mostly cookies; I’m not sure if they have or make other diabetic friendly items (such as cakes). It’s a good bakery with some sweet options (like that Strawberry Pie!) if you’re down in National City or are craving some baked goodies. I love the cool, retro sign! I’m glad you like the sign..I owned George’s from 1975 to 2007, when I retired. Because it is now closed, I have started making a very limited menu of George’s items. 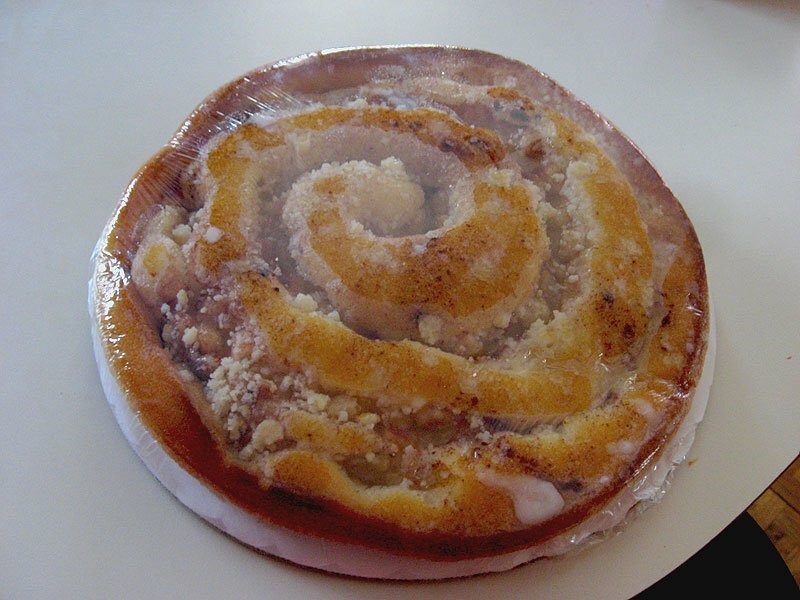 Items available are the Famous Lemon Snow Cake, Brownies, and Fresh Strawberry Pies. If you are interested please call 619-477-9369 (the old bakery number) for more information. I love that stuff grew up on it…r u not doing that anymore now? I was so sorry to read the bakery was closed, we always bought our cakes there. Bought one of your neopolitan cakes (my personal favorite ) for my friends from bingo, it was a hit for their 66th wedding anniversary. Everyone loved how light and not overly sweet it was. You will be sorely missed. I’m Waida Patterson, I’m stuck in a nursing facility in La Mesa now and would have loved getting one of those for a friends mothers birthday. you were wonderful!!! Are you still making the lemon cake from your home? If so i woud love to purchase one please. I love the little smiley chef hat guy under the sign, too. Love the name of this place. 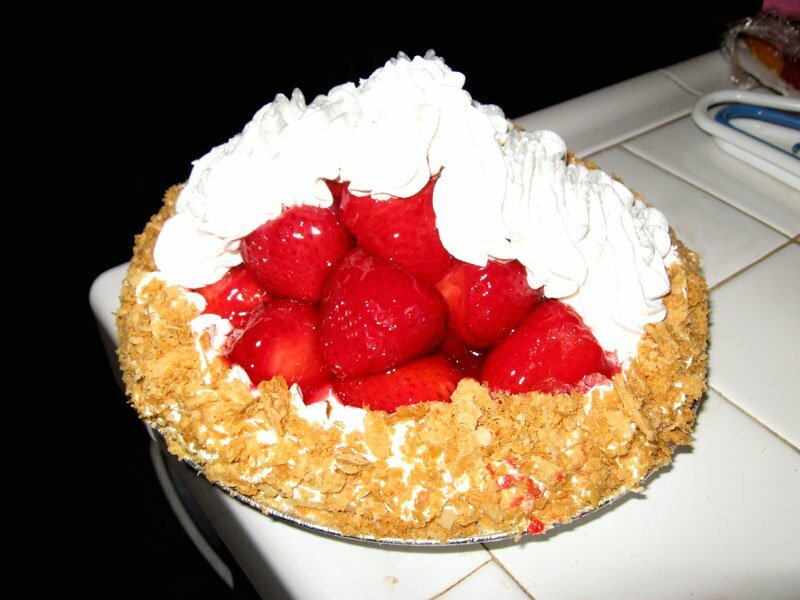 That strawberry pie sounds scrumptious! Liz: I like the name, too! It looks like its been around for a long time with their retro looking sign. I grew up in National City and still live in San Diego. We have especially enjoyed your lemon snow cake and your brownies for the last 60 years! Sadly you are closed! My girlfriends 66 birthday is coming up and her favorite cake her whole live is your lemon snow cake! Can I buy it anywhere else, or could I have the recipe. Hi Pat – Thanks for your comment but the owners will probably not see it since this blog is not associated with George’s. 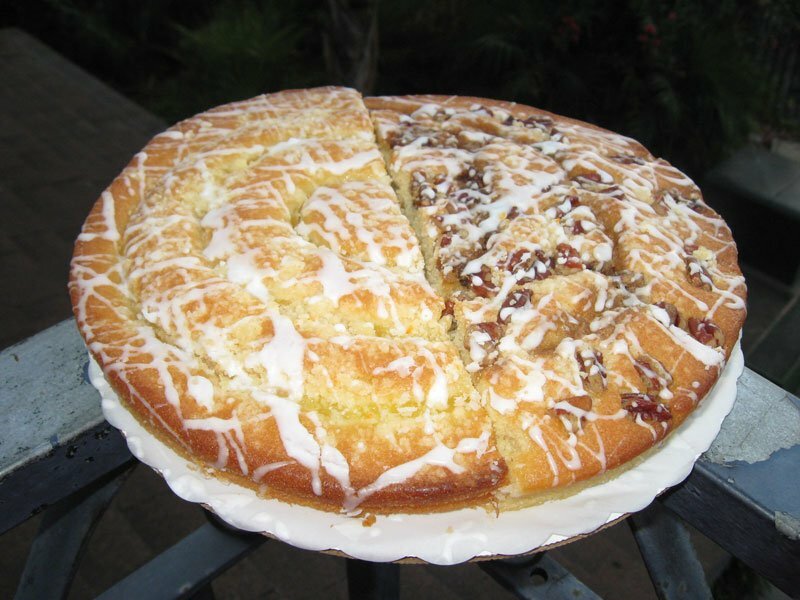 I did find a recipe though from another San Diegan who used to enjoy the Lemon Snow Cake – check out the recipe here at Lil Ms. Sueshine’s blog. Thank you so much for the lemon snow cake recipe link! 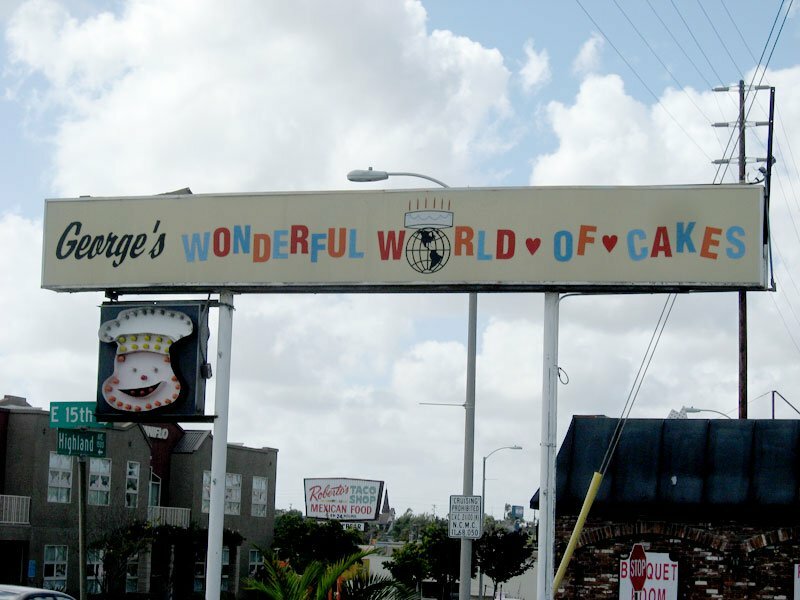 I, too, was a HUGE fan of George’s Wonderful World of Cakes and I was devastated when I found out that they closed! Their lemon snow cake was soooo good and I was sad that I might never taste it again… but thanks to your link (which I found by doing a google image search for “lemon snow cake”; I recognized the lemon snow cupcake and quickly clicked that link!) I can now try to make it at some point. What a life saver! Thanks for stopping by – hope the recipe works out for you! I too found the same recipe that Mary found and made it this past weekend. All I can say is OMG. It tasted just like George’s. It’s a keeper! Thank you for your support over the years. I was the owner for over 30 of those years and I too am sad that it is now closed. But since they are closed I have started making Lemon Snow Cake, Brownies and Fresh Strawberry Pies. If you are interested please call me at 619-477-9369 ( the old phone number) and see if we can supply your friend with a birthday Lemon Snow Cake. Looking forward to hearing from you. Does anyone know George’s Wonderful World of Cakes brownie recipe?!! Yes, as a matter of fact I do. But even better I know how to purchase George’s Brownies. I owned George’s from 1975 until 2007, when I retired. Because George’s is closed I am making a few of Georges most popular items. I am making Lemon Snow Cake, Brownies and Fresh Strawberry Pie. If you are interested please call 619-477-9369.